Coconut macaroon cake from 5 Second Rule is a perfect passover recipe. Cookbook author Cheryl Sternman Rule has adapted this cake recipe from François Payard's coconut and chocolate stacked cake to follow the dietary restrictions of Passover. 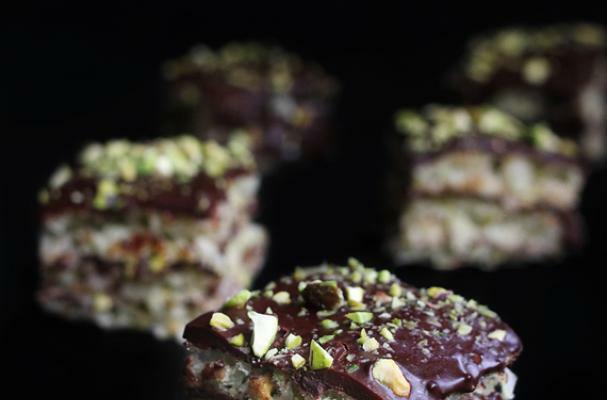 A cardamom scented coconut and pistachio cake is layered with a bittersweet chocolate ganache. Since this cake doesn't contain a leavening agent, whipped eggs (until it reaches the ribbon stage) incorporate air into the dessert. it is also totally grain-free and dairy-free. Every bite is sweeter and more delicious then the last. For full recipe instructions, click here.